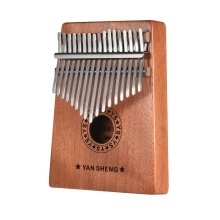 High-quality mahogany wood material, simple design and exquisite workmanship, providing you with excellent sounds; triple sound holes and 17pcs metal tines, warm tone and long sustain. International standard C tune design, the corresponding tune of the tines are 1(D), 2(B), 3(G), 4(E), 5(C5), 6(A), 7(F), 8(D), 9(C4), 10(E), 11(G), 12(B), 13(D), 14(F), 15(A), 16(C6), 17(E)(from left to right). Easy to play, just holding it in your hands and plucking the tines with your thumbs to create clear and melodious sounds; easy and quick learning. Compact size and lightweight, convenient to carry around, you can make wonderful music anywhere; suitable for travel entertainment, religious ceremonies, weddings and other social gatherings. Comes with a tuning hammer for adjusting the tines, musical scale sticker & notes sticker for playing assistant, a small bag for easy carry, 2 finger stall and a cleaning cloth.